It's been a mixed bag lately. 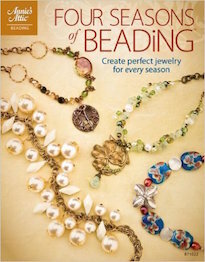 On one hand, I am very excited to be going to Bead & Button in Milwaukee and spending time with my family at Green Girl Studios and seeing all my bead show buddies. That I am absolutely thrilled about and cannot wait for. On the other hand, my allergies morphed into a rather nasty cold that I can't quite shake. Working long hours doesn't contribute well to my recovery. I could elaborate on the grossness of my recently malady, but would rather not disgust everyone with stories of mucus. I never knew that humans could make that much mucus a day. I've been making lots of projects for the upcoming show, but as there are only a few days left until I've got to leave, I don't know how much I'll be able to finish. We'll see. I just found out that the Journal of Mythic Arts is no more. They've posted their last entry. It's a shame because I've only just now found them and was so very enamored with their posts. Luckily they will remain an online presence - just as an archive though. My move to Sunset Park is a good one. Though it is progressing much slower than I had planned. It's mainly due to the fact that I've been sick and I've been trying to spend every last second trying to get ready for the upcoming show. After the show, I'll really get cracking on getting things packed up and finished painted. Oh and I've been desirous of a Kiki Smith shirt from the Gap. They've released a limited edition line of shirts commemorating artists of the Whitney Biennial. I know it's a woman's shirt, but with a blazer, it totally would be okay for me to wear. I've gone to almost all of the Gaps in lower Manhattan without results. I will try some of the other ones later. I would buy one online, but they sold out within the first 24 hours and I don't really feel like spending $80 for it on eBay. Kiki Smith also apparently came out with a wallpaper. I am desirous of it as well. Though I haven't been able to find a source that will quote a price. Perhaps I will go to the showroom that produces it, as there is one here in New York. I used to think that I never had time to read, but then I started carrying around a book with me to always be able to utilize those wasted moments on the train or in line. It was surprising to see just how much time wasn't being cultivated. I just finished reading Lavinia by Ursula K. Le Guin, author of A Wizard of Earthsea. 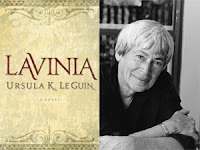 Le Guin pulls the silent character of Lavinia from the lines from Vergil's epic poem, Aeneid, and gives her a voice and expands upon Vergil's unfinished work. The result is rich, woven like a tapestry of words depicting a world before the building of Rome. Flowing like poetry, she masterfully crafts a novel about duty, omens and portents, war, and the various forms of love one can experience. I won't die. Of that I am all but certain. My life is too contingent to lead to anything so absolute as death... And yet if I must go on existing century after century, then once at least I must break out and speak... My mother was mad, but I was not. My father was old, but I was young. Like Spartan Helen, I caused a war. She caused hers by letting men who wanted her take her. I caused mine because I wouldn't be given, wouldn't be taken, but chose my man and my fate. Friday afternoon, I set out to get some coffee. I had only plans to go around the corner to one of my favorite coffee shops, Gimme! Coffee. I didn't even bring my phone. I just brought my reading book and an umbrella. I got my coffee and the next thing I knew I was at the hardware store talking with the clerk about the new biodegradable shopping bags they were now using. I also picked up some more copper wire and a paint edger while I was there. The next thing I knew, I was on the train headed towards my new apartment and new studio. The rest of the afternoon and evening, I spent painting my studio until I ran out of paint. I'm using Bardsley Grey from the Ralph Lauren's Regent Metallics line. As much as it's green and grey, it looks almost like an antique bronze. When morning came, I decided to explore my new neighborhood. It's an interesting mix made up primarily of Chinese and Latinos. It still hasn't been touched by developers and is delightfully devoid of luxury condominiums. I like best the bay windows in almost all the buildings and the surprising gargoyle here or there. As it was a holiday weekend, those who didn't have to work were out relaxing with their families and everyone was in good spirits. I walked to Sunset Park, about six or seven blocks away from my new apartment. I looked out on the horizon and saw so many different things. I kicked myself for not bringing a camera, but I hadn't intended on any expeditions. So, I picked a point in the horizon and I made my way towards it. And then I found another, and made my way towards that. I saw St. Michael's and the beautiful crumbling building next to it, then walked mostly along 4th Avenue. I made a few detours whenever I saw something that caught my eye, but for the most part, I stayed along where the R/N train runs. I saw where the Living Room Lounge is finally and walked around Green-wood Cemetery and stopped for coffee at the Root Hill Cafe. I walked through the DanceAfrica street fair at BAM. My favorite places were the ruined ones, the crumbling places that weren't shiny and new and had wild grasses and bent trees twisting up from fallen bricks. Those places, where the bird songs were almost deafening were my favorites. The wind seemed a little bit thicker there, as though the ghosts of the place were passing through your fingers. Eventually though it got dark and I realized that I had been without my phone or connection to the world for some time and that there were probably people who needed to get in touch with me. I eventually found an entrance to the G train at Fulton street and took the train back, savoring a day spent all on my own in quiet meditation with the ghosts of Brooklyn. I must extend my apologies. I haven't updated in a while, which is unusual for me. Normally, I task-master myself in posting at least one blog post a day and spend at least an hour commenting on other blogs. 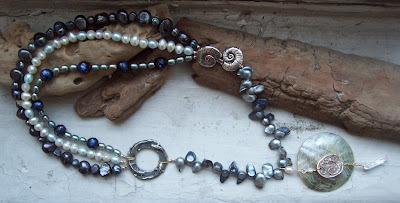 Alas, my allergies have been killing me and I've had a house guest over as well as have been working at my day-job constantly and trying to create new things for Bead & Button. All in all, my plate has been pretty full. I think tonight we're going to make a family-style meal of ceviche and other various exotic and fresh foods. I made a babinka the other night and although not quite as good as mom's, it was pretty tasty. Maybe I'll make some puto if I have time. We'll definitely continue our Buffy: The Vampire Slayer television show marathon. I can work well while it is on and it is still just as entertaining as it used to be. Right now it's time for coffee. This piece was inspired by two great artists. The first is a poet by the name of Francis Thompson. 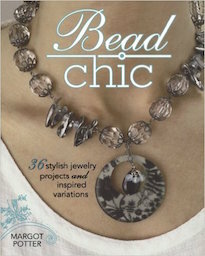 The second is the amazing silversmith, Anne Choi. 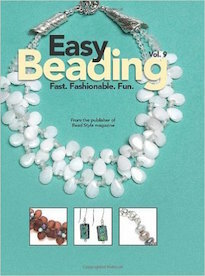 She crafted the two barrel beads that have parts of his poem on them. I am beyond smitten with her work. 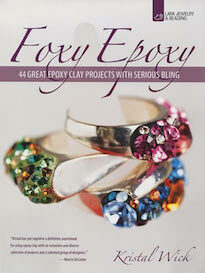 The delightful and lovely, Heather Wynn, has just opened her very own Etsy shop! And it's simply wonderful. 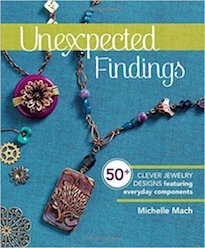 She's included an array of her stamped polymer clay pieces. I just adore her work. 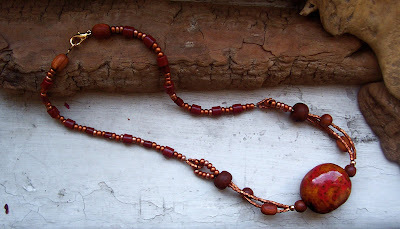 Each of her pieces carries a little bit of her heart with it, expressing bits of poems and snatches of songs. CLICK HERE to check it out! Have you seen Tony and Lisa's new bronze components on their Etsy site? They're great! 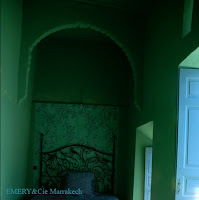 They've got a beautiful verdigris patina and a cool golden glow. Consider me smitten! CLICK HERE to check them out. I took the night off from working and decided to see Prince Caspian. I thought it was pretty good. It was definitely much more action-packed than the first. Though, I missed Tilda as the White Witch. She was in it for a couple of minutes, (of course my favorite bits) but not nearly enough. Hopefully she'll reprise the role in the prequel/sequel in the Magician's Nephew. So, here's a picture of my yet to be finished Golden Hind. Her body is covered in two tones of Swarovski flatbacks, golden shadow and silk. 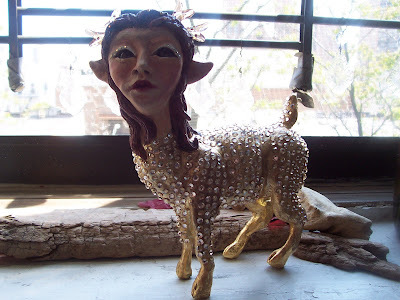 Her antlers are made from the new coral branch Swarovski pendants and her eyes are made from deep brown Swarovski pearls. She's also got 5ss sized flatbacks in mocca and smoked topaz in her hair. On her tail and on her eyelashes are grey opal flatbacks. As you can see, there's a few barren spots on her. I've got go back in and fill in the blank spots. I've also got to finish the box that she's supposed to top. The walls of box are made out of resin and have... surprise, surprise... crystals embedded in them. So, I missed some deadlines and I'm surrounded by half-finished projects. Part of me is really upset about this. I've spent lots of time and money on these things. Many nights I've only slept a handful of hours, because I've been working hard on finishing everything up. I've sacrificed time with my friends and family so that I could complete them. Alas, I've seemed to have bitten off more than I can chew. But I think there's a lesson in this. At first I thought it was about knowing my limitations and accepting my limitations. From a logistical point of view, that sounds good and safe. But as I typed those words out, I felt a deep sense of rebellion and abjection. The heart of what makes my work work, is that it dreams BIG and is paved with a thousand little details. Even in my most minimalist works, the heart is found in the attention I pay to the little things - surfaces, finishes, materials, the rituals of process, and little secret things that only I know about. Without these things, my work falls flat. I think it still has merits, but ultimately it's a watered down version. I set out to write a post on how I needed to learn to accept the limitations of others - deadlines and schedules and logistics. What I came out with was something far more valuable - learning to accept myself. So... maybe I didn't finish in time to be the grand master sparkle king or I won't be included in such and such magazine or this book or that one. But at least I tried and stuck to my principles of not compromising my work. I'm too busy trying to finish up some projects for a fast approaching deadline to put together a proper posting. Instead, I'm going to share a few shots (I took off their website) of some goodies that I got from Brown Bag Industries. They were SO good, it's makes any crunch-time nearly bearable. Make sure to stop by THEIR ETSY SHOP. I did! Poppy Seed Thumbprint Cookies in raspberry and apricot. 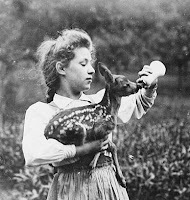 To the left is another really endearing (vintage) photograph of a girl feeding a fawn. To the right is a photo of a gilded deer taken from a Pazyryk burial from the 5th century BCE. Learn more about deer mythology by CLICKING HERE. 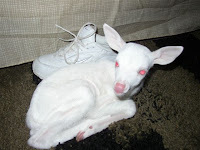 Speaking of deer, I couldn't help but post this photo of a little baby albino fawn someone found. Sadly, it was wandering around without a mother. CLICK HERE for some Chickasaw folklore about a white deer and wedding dresses. This is an etching made by Theodore DeBry of a drawing done by Jacques LeMoyne of the Timucua people. This particular one is of a stag hunt in FLORIDA in the sixteenth century. CLICK HERE to learn more about the French's "foothold in Florida." To the left is a sculpture done by Wendy Froud. It has served as another point of inspiration for one of the projects that I'm working on. 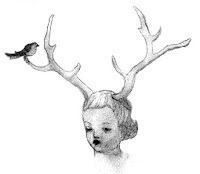 It is interesting to delve into the research behind the "deer woman" and "antler girls." According to some Native American sources, the deer woman is a beautiful temptress who lures men away from their homes and lives, to leave them in madness. Apparently, the only way to detect if this woman is not human, you have to look at her feet, which if it is a deer woman will be a set of deer hooves. The abundance and diversity of mythos is really astounding. It'll all become apparent why I'm doing this research soon enough. Here is another piece that I've been using as a source of inspiration. It comes from Ashley Alexander, the artist behind I'm Smitten. 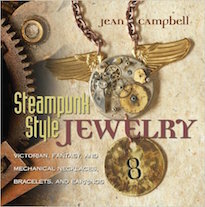 The website features a really great selection of handbags, shirts, stationary, buttons, and prints. And you know I love all the anthropomorphic creatures! 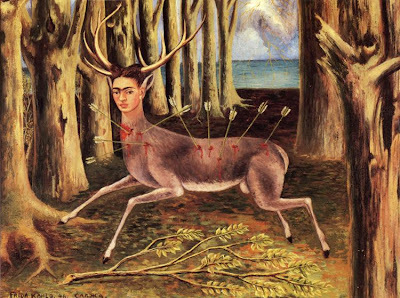 I thought that I'd post this picture of a Frida Kalho painting called, The Little Deer. You'll see in a little while. It is serving as one of my reference points for a project that I'm working on. Due to both our crazy work schedules, I hardly ever get to see my mom. Although we haven't always gotten along (I can be hard to handle sometimes), I still love her and respect her! Her stories and eccentric quirks helped shape the person I am today. To the left is a picture of her grabbing my head at Azalea's last birthday party, asking me why I wasn't married and had babies yet. Happy Mothers Day, Mom; may you never lose your aim! After my "incident" on the train, I stopped by the Brooklyn Flea for lunch and to visit my friend, Sarkilahti of Odette N.Y. While I was there, I picked up a plushy toy for Azalea at Karen's Monsters, a salvaged tin tile (that I'm going to reproduce in a paper and resin combination for ceiling panels in my studio), and an owl etching. All the while I was thinking of different things that I might do with my new bed. Since I can't drop $15,000 on a bed frame like THIS ONE that I already blogged about, I sought out different ideas. 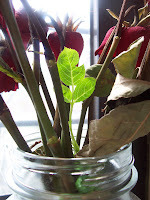 These photos are ones that I lifted off Ullabenulla's blog. Right now, I'm really feeling the forest-hideaway vibe. My allergies are in kicking in full-blast right about now. Which doesn't make for a very productive day. In fact, it makes for a very embarrassing day. I was heading back on the train from cleaning up my studio and waiting for my new bed to come, when all of a sudden I sneezed. It wasn't a cute little sneeze. It was a clearing out the sinuses sort of purge from my nasal passages sort of sneeze. Oh, it was so gross! I literally had yellowy snot dripping down my shirt, my face, and all over my inner elbow (as we were taught not to sneeze in our hands). Everyone sitting in the immediate area had a mixed look of horror and disgust on their faces. And, as it would happen I didn't have any tissues with me. Luckily after one of my fellow passengers saw me trying to mop up the mucus with a handful of receipts, she pulled out a few tissues from her purse. I was totally mortified and happy that the next stop was my stop. Above is a new necklace that I've been working on. 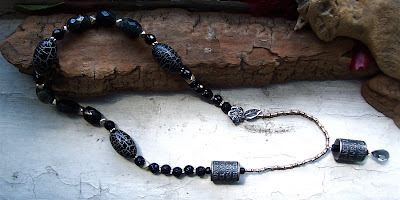 It has components from Earthenwood Studio, wood beads from J & M Gems 'N' Beads, an Anne Choi key bead, a key piece from my family at Green Girl Studios, and a little key and lock toggle from Ornamentea that's just so charming. A package came in the mail for me. To the left is a scan of it. The surface was absolutely covered in stamps, placed here and there. One would think it came from far off lands - not just Pennsylvania. "The best and most beautiful things in the world cannot be seen or touched. They must be felt with the heart." I just got my first "Tortured Heart" by Tony Blackwell of Zoa Art in the mail today. It's amazing! 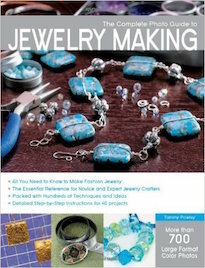 Tony and Lisa just started their first Etsy site and feature an assortment of hand-crafted goodies there. Not only is their stuff pretty darn awesome, but so is the service they provide. I got my "tortured heart" in what seems like a heartbeat. It came securely packaged and (did I mention?) very quickly! Great job, guys! It is quite late right now. Sleep has not come to me yet. Instead I work on the projects that cry out for my attention. As there are many, my sleepless night is being put to good use. Still yet, an image is stuck in my head from earlier today. 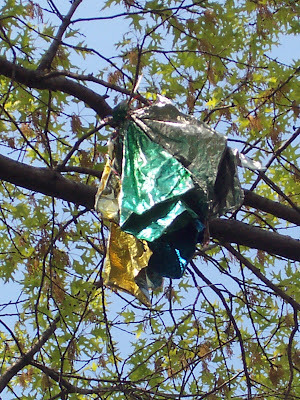 As I was waiting to meet up with Iviva, I looked up and saw this balloon stuck in the tree outside the entrance to the Brooklyn Flea. All sorts of random associations and questions popped inside my head. 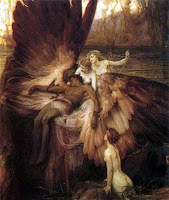 I wonder if Icarus would have fared better were his wings made of mylar rather than wax and feather. Or, do you think, perhaps his pride would still be his doom? Maybe the shine and flash of the mylar flapping in the wind would have sped him even sooner to his fateful fall? 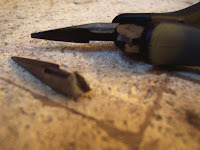 I was working on a wire-wrap project, when all of a sudden, the pliers broke! Part of it just snapped off. It's sad considering how much I used them and was attached to them. The caption should read: Abused with Love. This was my first Sunday off in ages. 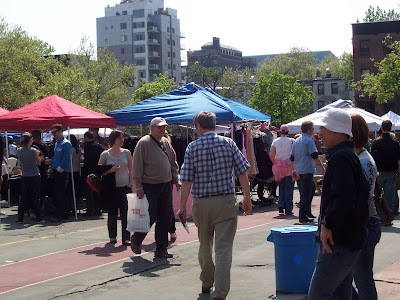 I decided to go to the Brownstoner's Brooklyn Flea and see what treasures were to be found. The weather was perfect for the event - warm and sunny! Above: Random crowd shot of the Brooklyn Flea. Above: This is my yield for the flea market. I wore my jacket and scarf, not knowing how warm it would get, and ended up getting a grey tote bag with lemons on it from Minusbags to carry them. I might embellish it a little to make it more my style. I also picked up a cool print of a collaged piece by Carla Venticinque. I got a greeting card and a t-shirt for Azalea (both with owls on them) at Foxy & Winston. Whimsy & Spice was there. 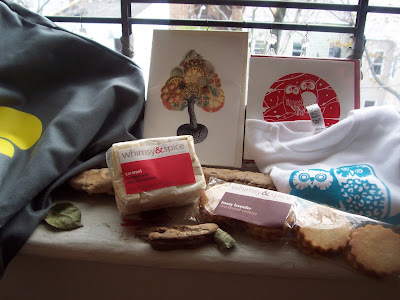 So, I got a batch of their caramel marshmallows and a package of lavender honey cookies. Yum! It is perhaps a good thing that I don't live near my favorite Flea Market of all times: The Central Florida Fairgrounds Flea Market. 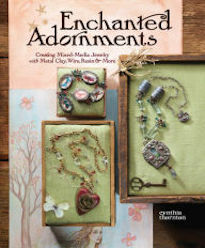 It is home to all sorts of oddities and curiosities perfect for a mixed media artist. Ever since we were little, we'd go almost every single weekend to see what treasures were waiting for us. My dad would look for tools and whatever car parts were needed. My mom would look for dishes and ceramic figurines and miniature perfume bottles and of course the fresh fruit. Cynthia and Sheila would look for jewelry, divination tools like rune stones and tarot decks, and unique bottles to put in still-lifes. My brother would look for bike parts, books on languages (and James Bond), and paint-ball paraphernalia. At first I always had my eye out for toys or the occasional free kitten. Eventually my mom and I would collect VHS tapes of movies we hadn't seen. Then, when we started going less, I would look for spice jars and mirrors. I just realized that as soon as our family started to fragment off, our familial rituals, however mundane, became fewer and fewer. Oh! 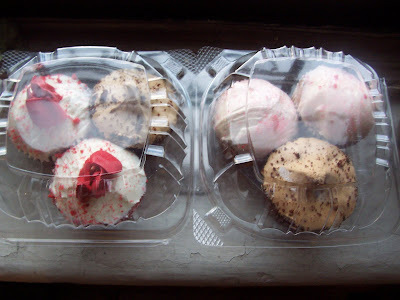 And how could I forget these lovely cupcakes? I got them at the big booth next to Wafels & Dinges. I can't recall the name and I'm not sure if they were from Brown Bag Industries (which I just bought -all- their lemon poppy seed thumb-print cookies at their Etsy shop since I couldn't find them at the market) or Hot Bread Kitchen? Or maybe it was the Choice Market stand? Not sure, but they were good. After walking around the flea market, I met up with Iviva Olenick for coffee. It was wonderful to catch up with her! Not to provoke nasty jealousy or anything, but I am now the proud owner of one of her delightful embroidered pieces. While at an excursion to Gimme! Coffee for my caffeine-fix I picked up a copy of a compilation disk called, P.S. 318 Warehouse Songs. It's produced by a really great organization called Local Correspondents. One of the songs on the album is "Homeward Bound" by Tanya Buziak. Sometimes you hear a song that in combination with the surrounding circumstances, strikes you full in the chest and makes you feel. It's a powerful phenomenon. For me, at this time, this was one of those songs. I felt horribly homesick for my family. I'm pretty content here in the City. Things are seemingly going fairly well. Even if things weren't going as desired and I wasn't peachy, I'd definitely be too busy to take notice. But it has been such a long time since I've seen my family and I miss them dearly. I especially miss Azalea. I could feel all of my heartstrings being yanked up from deep inside me. When this happens, I feel a sense of fierce hermitism. Along with that is a strong urge to nest and set down new roots, deep and anchoring. One of the things that I do while feeling as though I should nest is Google searches. Searching for things and hunting for dream furniture and accessories always makes me feel a little better. 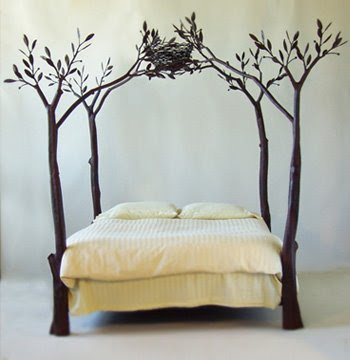 I found this great "Tree Bed" by Shawn Lovell Metalworks. I'm sure that if I had an extra $15,000 laying around for a fancy bed, I'd feel better. I guess I felt literally like "nesting" with this bed. 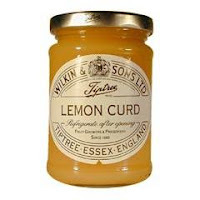 To go along with my personal process of consoling myself, I enjoyed some Lemon Wafers from Heaven Scent Natural Bakery slathered with Lemon Curd from Wilkin & Sons' Tiptree. After these small indulgences, I do feel a little better. I still miss my family, but it doesn't sting quite as much as it first did. 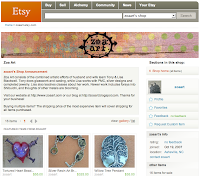 I was just over at Tony and Lisa Blackwell of Zoa Art's blog and discovered that they've just set up an Etsy shop! 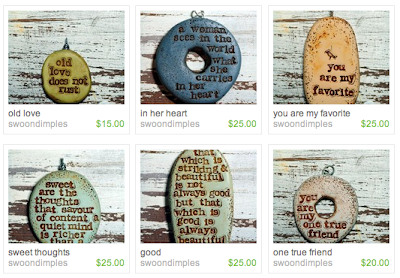 I'm absolutely addicted to Etsy. This is just one more reason to be so. CLICK HERE to check it out. 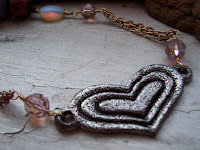 They've posted great items like Tony's "Tortured Hearts" and Lisa's PMC and shibuichi components. All together and in combination they spell out a horrible word: M-I-G-R-A-I-N- E. I was struck today while I was away at work. It was no fun at all. I hate the recipes of destruction - they hurt! Here's a new piece I call, "Silver Mermaid." That may sound like a cop out title, but it's actually a line from a song that I quite enjoy called, "Sad Stephen's Song" by Duncan Sheik. 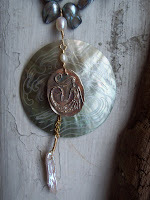 I used a pewter Bob Burkett koi fish ring, a Hiroshige patterned shell from Lillypilly Designs, a clasp from my family a Green Girl Studios, a PMC mermaid pendant, and lots of pearls from Talisman Associates.